On my list of would like to do for the holidays once the must do was done was a new tree skirt. I lost one that I'd made several years ago and didn't want another year of wrapping a towel around the bottom of the tree! I based my skirt on this tutorial with some minor changes. I added an extra border of white to make it a bit bigger than the tutorial called for. I found the instructions on cutting the tree to be very confusing so I took the basic measurements given (8 3/4 wide and 10 1/2 tall) to create a rectangle with those dimensions. Then I drew a line from each of the bottom corners to the center of the top. It worked perfectly. I didn't have enough red in my stash to bind everything in red and I didn't like the idea of an all black binding so I improvised. There is white going up the center and black around the edges. 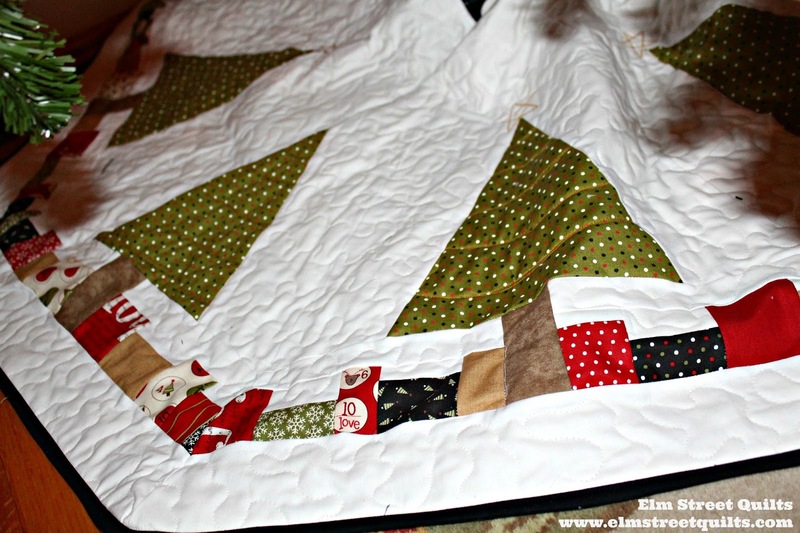 I quilted in an all over meander and used gold thread to put garland on the tree and stars on top with my FMQ foot. I'm thrilled with the way it looks under our tree! 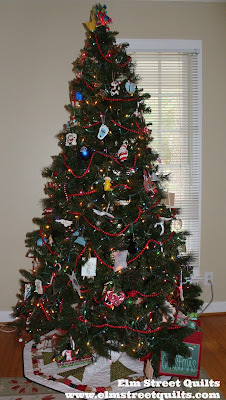 Our tree is filled with handmade ornaments from when the kids were small plus ornaments collected on family vacations. It is always fun to go down memory lane as we decorate. I wish you and your families the most wonderful of holidays!! I'll be linking up my finish with Main Crush Monday's, Sew Cute Tuesdays, Freemotion by the River, WIP Wednesday's, Let's Bee Social, Midweek Makers. Fabric Frenzy Friday, TGIFF, Finish it Up Friday and Finished or Not Friday. Note - the One Monthly Goal finish part will post on December 25th at 3:30pm. Your tree squirt is beautiful. Our tree ornaments are also a walk down memory lane. Keep the memories bright :)! Patty I love your tree skirt! I've wanted to make one for a while too but it isn't happening this year. There's always hope for next year, right? The trees on yours are perfect for a tree skirt, and those little gifts are fabulous! Love it!! All the little packages under the trees are just so cute. Marvelous way to use up some Christmas scraps. Merry Christmas! This turned out so pretty! I have a box full of ornament treasures that I didn't hang on the tree this year. I'm missing the sweet memories it always gave me. Love, love your tree skirt! I especially love that you took the basics and changed it up to make it your own and to work for you! Happy Holidays to you! Your tree skirt turned out so cute! I really like your tree skirt. Beautiful tree and tree skirt. Merry Christmas! Sweet tree skirt! Looks gorgeous with the gold thread detailing - what a great idea. Merry Christmas! Made my skirt a couple of years ago almost identical to this one and a matching cloth for the dining table. A beautiful finish! Have a very Merry Christmas. It looks perfect under the tree!